Mega Sale! Free Shipping Included! Save 22% on the Waxed Canvas All Purpose Knife Roll (5 pockets) Handmade by Hide & Drink :: Suede by Hide & Drink at Sara Stage. Hurry! Limited time offer. Offer valid only while supplies last. This Rustic Leather Knife Roll is hand crafted with the finest Full Grain Leather to give a safe and stylish home to your valuable set of knives. This Rustic Leather Knife Roll is hand crafted with the finest Full Grain Leather to give a safe and stylish home to your valuable set of knives. 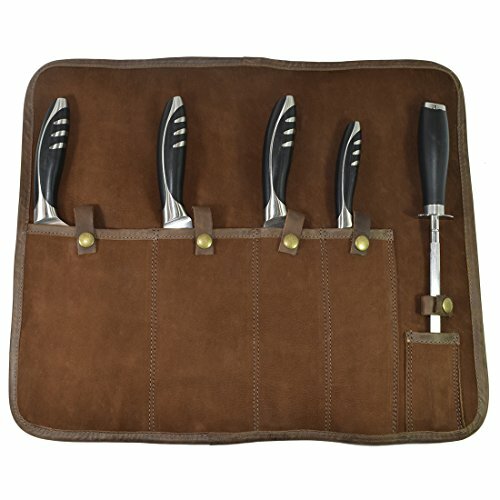 This highly attractive leather knife roll contains 5 pockets and a side pouch to store your most coveted chef knives and sharpening files. Perfect for all chefs, from beginners to professionals, this leather knife roll is made with full grain leather and brass hardware and ties up simply with a leather cord so that you can carry them with stylish flare. VINTAGE-STYLE KNIFE ROLL: Add a touch of chic and class to your set of trusty kitchen knives with this simple yet stylish Rustic Leather Knife Roll. Made with Full Grain Leather, the best leather around, it will provide your expensive and valuable knives with a sturdy, reliable and elegant home. With 5 pockets you can safely and securely store a range of large to small knives and a side pocket for your sharpening files, notebook for recipes and notes etc. so that you're ready for any occasion. APPEARANCE IMPROVES WITH AGE AND USAGE: The fantastic property of Full Grain Leather is that over time and with use, the beautiful grain will attain a unique patina that will show that it is age with grace and experience. As the chef grows with experience, so will this exceptional Rustic Knife Roll grow with beauty and class. IDEAL FOR ALL CHEFS: From the budding Range Chef to the high ranks of the Executive Chef, this Rustic Knife Roll is the perfect addition to their kitchen's arsenal. Ties up neatly with a leather cord, making it easy to roll up and store for on the go from home to kitchen, protecting your blades from any possible damage. DURABLE WITH FINELY STITCHED SEAMS: The Rustic Leather Knife Roll is designed with the chef's busy day in mind: finely stitched at the seams to prevent any fraying or unraveling, the Knife Roll is durable, heavy duty and built to last the extreme conditions of the kitchen. MAKES A UNIQUE & UNFORGETTABLE GIFT: This makes a fantastic gift for your loved one who likes to make a mess in the kitchen, your friend who sees themselves as a Michelin star chef, to your family member who couldn't boil an egg. For everyone of all ranges, this makes an unforgettable and thoughtful gift.